My birthday was last week and it was also Pi day! = 3.14159265 So of course I had to make myself a skinny gluten free birthday pie. Last year I planted papaya seeds and now we have a 15 foot tree! We had baby papaya trees growing like weeds all over the garden. Most died but one big seedling survived and we now have 7 papayas ripening and the first one just fell off. I love it! We use them for papaya smoothies and just eating it raw of course, but I've never had a papaya pie in my life and it sounded good. It was crazy good! So exotic and tropical. It tasted like sunshine. The flavor and texture is a cross between a peach and a mango. It bakes up tender and it doesn't go mushy at all. I mixed it with apples for a little more texture, but I don't think I needed to. Next time I'll try it on its own. Or how about with berries...yum! Did you know that 1 small papaya's contains 8% of your daily potassium, 159% of Vitamin C, 29% of Vitamin A and only 17 grams of carbohydrate. Isn't that great? So delicious and super healthy. Enjoy! 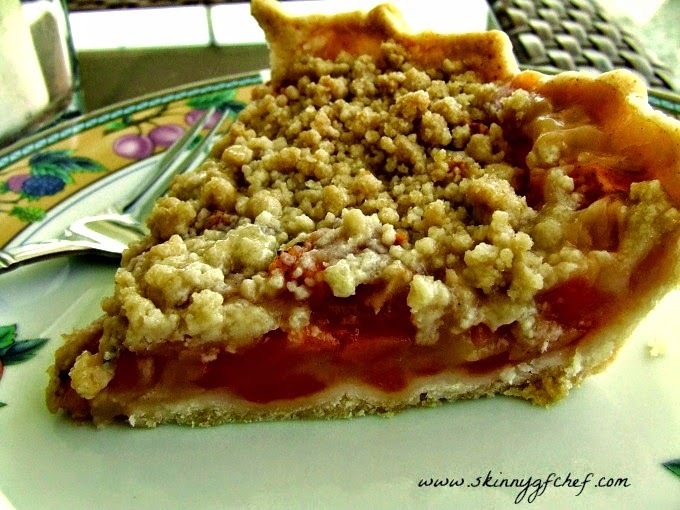 1- 10 inch gluten free pie shell-click for my recipe or use low carb recipe below. Prebake raw crust for 10 minutes at 375 degrees F.
I use this Pyrex dish it's almost 2 inches deep so I can pile in the fruit! Pulse the almond flour, egg, and salt for 10 seconds. Add a tablespoon of fat at a time until dough comes together. I usually use 3 tablespoons. Press into the bottom of pie pan and work out from the middle and up the sides. Toss the filling ingredients lightly in a large bowl. Pile into to prebaked crust. Using a large fork, mash the flour, sugar and fat until crumbly. Sprinkle evenly over filling. Bake on a baking sheet to catch any drips for 45 minutes or until brown and bubbly.